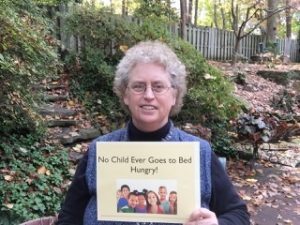 No Child Goes Hungry is the brainchild of Rev. Kären Rasmussen, who currently serves as the director of the organization. A Unitarian Universalist minister, Kären sits on the Board of Directors for Britepaths in Fairfax, VA.
She has been a chief architect of successful projects like Complete the Circle, a volunteer service project to raise awareness and take a stand against hunger and need in Fairfax County, and the Weekend of Service project at the Unitarian Universalist Congregation of Fairfax where over 800 hours of service are logged in one weekend each year. While working with other hunger-relief and poverty support organizations, Kären became aware of just how problematic hunger is, particularly for children. Because of this, she envisioned a world where no child would be hungry when they went to bed at night. 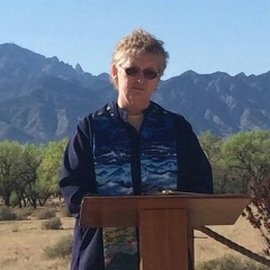 After talking to other ministers, members on the Britepaths Board of Directors, UU Ministers in the Entrepreneurial Ministry training program and community activists, she decided to put her dream into action. Through ministerial conferences and community connections, she found her first organizational participants who could leverage small grants to make childhood nutrition more secure. Kären is skilled at making connections and provides assistance to help others use resources and volunteers from their own organizations to address child hunger needs in their own communities. NCGH works with congregations and organizations who are already working to secure food for children or who have commitments to engage in this work. If your organization would like to be considered for future participation opportunities, create a fundraiser, or are interested in making a financial donation to No Child Goes Hungry, please contact us here.